As the world's leading productivity software, Microsoft Office plays an integral role in the daily lives of professionals. Understanding how to quickly and accurately use Office 2016 can improve your productivity, and provide you with all the tools and knowledge you need to be successful. This ebook from Wiley usually retails for $20, but for a limited time BetaNews readers can get it free. Choose your path for learning and explore the fundamental features of Microsoft Office 2016 through task-based exercises supported by online video. Dive into Microsoft Word by creating a document, formatting paragraphs and pages, and adding tables and graphics. Explore Microsoft Excel's ability to analyze data through creating formulas and functions, and learn to format and print spreadsheets. Use Outlook to organize your work day, and find out how to make amazing PowerPoint presentations using the new features in the 2016 version. 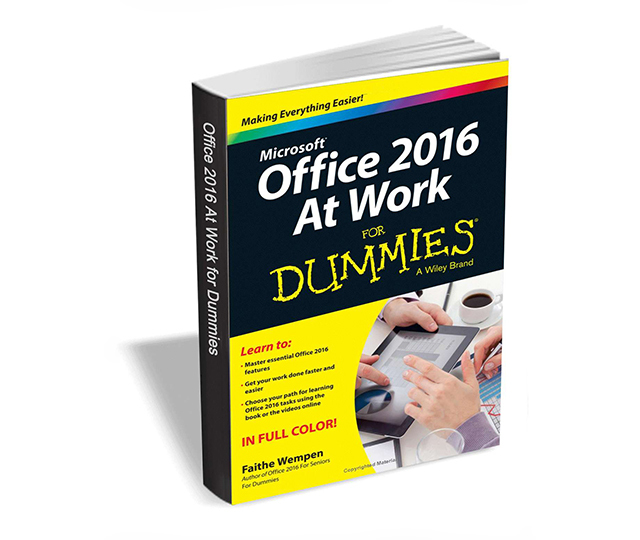 Microsoft Office 2016 at Work for Dummies is the perfect companion if you use Microsoft Office regularly and need to get up to speed on the changes with the latest release as quickly and efficiently as possible. The offer expires on May 24, so act fast.